American DJ Spherion TRI LED Lighting DJParts - All Variety of Parts that DJ Needs. 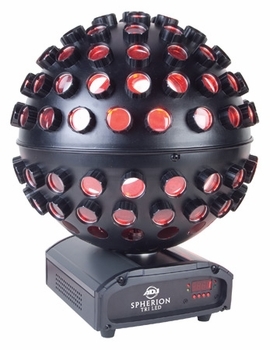 The Spherion TRI LED produces an effect that is similar to a modern Mirror Ball. It features five bright 3-Watt TRI LED sources that project sharp beams of light from 116 lenses that rotate and fill an entire room. The unit has a low 27W power draw, and includes rubber feet and a removable hanging bracket so the unit can be set on a floor or table or hung from the ceiling. 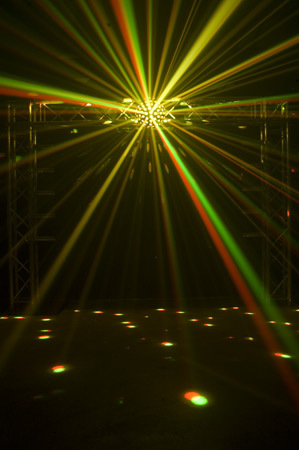 It''s three DMX channels allow users to control rotation speed and direction, dimming, strobing and color changing. The Spherion TRI LED also features exciting sound active programs that can be accessed by just turning on the fixture.